You are coming to the end of your term of what has to be the most thankless job in Costa Rica. I can’t imagine the stress of a job where no matter what decision you make, it has its critics. I have had the opportunity to be around you on a couple of occasions and there are things that really impress me about you. One is your concern for this country. The other is your presence around schoolchildren. The children look in awe as they meet the president of their country. Many young girls have realized that their dreams can be achieved by watching you become the first woman president of Costa Rica. To them you are a real hero. That is one legacy of yours when you leave office. I immigrated to your country 23 years ago and made it my home. My children are Ticos. Your recent signing of a decree concerning the already prohibited use of FADs (Fish Aggregating Devices) by the foreign tuna industry is a step further in strengthening conservation of juvenile species of many types of fish. The foreign tuna industry lately has been a topic of controversy, and both the commercial Costa Rican fleet and the sport fishing industry have together lobbied the government to move them further offshore, which would allow Costa Rican fishermen a chance also to profit from these prized fish. 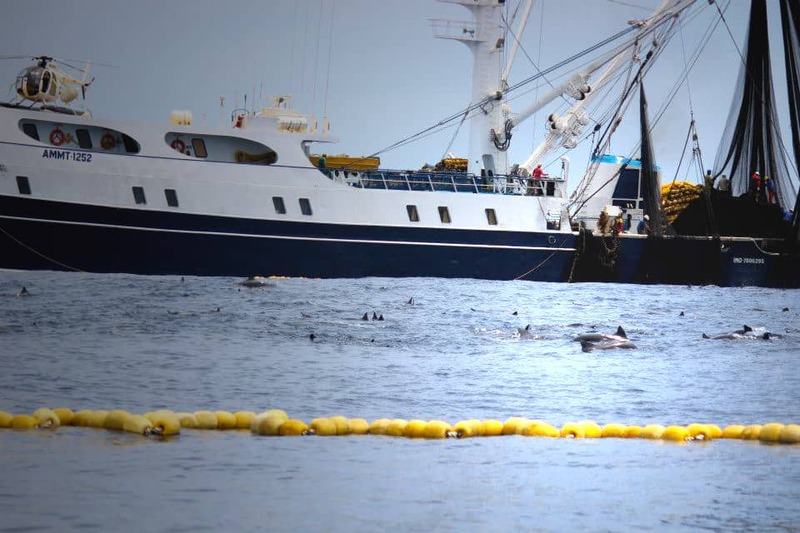 The word is on March 28, you will announce the foreign tuna fleet will be moved offshore to somewhere between 45 and 65 miles from the coast. That is not much when you consider Costa Rica’s territorial waters are 11 times greater than its land mass. When Costa Ricans go to the grocery store and buy a can of tuna fish, they may or may not notice the emblem on the label stating that the product is “dolphin safe.” What exactly does that mean? Supposedly it means that no dolphins were harmed while capturing the tuna. Most people have no idea how tuna are captured. More often than not in Costa Rica, large ships encircle schools of tuna swimming below massive pods of dolphins. Since 1950, more than 6 million dolphins have died at the hands of the tuna industry. Today they claim they have methods to release the dolphins before taking the tuna onboard the ship. 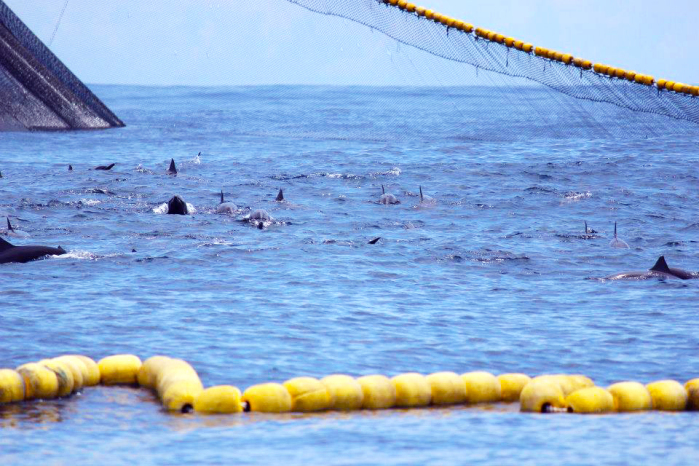 Even though the majority of these dolphins may be released alive, the panic and stress put on these animals is horrendous while they are held prisoner in the nets. When released, the pods of dolphins are separated, often leaving mothers and young apart. Commercial and sport fishermen who have spent lots of time on the ocean see firsthand how these tuna ships operate. They have helicopters to spot the dolphins. Then they drop explosives on top of the dolphins to drive the tuna toward the ship. This practice is illegal in Costa Rica but often used. According to Divine Dolphin, a company that operates a dolphin-whale tour and education program in Drake Bay, Costa Rica is unique in that it has a variation of spinner dolphin found only in this country named the Costa Rican Spinner Dolphin. This subspecies is only found up to 95 miles from the coast. 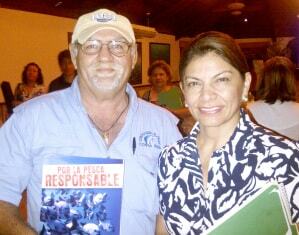 Purse Seine tuna fishing is not like farming. In farming you plant a crop like coffee, bananas, rice or beans and care for it until it is ready to harvest. Tuna fishing is pure extraction of a natural resource using a nonselective art of fishing with an unacceptable bycatch of other species and the harassment and incidental death of dolphins, one of which is only found in Costa Rica. With the help of Agriculture and Livestock Minister Gloria Abraham and Vice Minister Xinia Chaves, the three of you can leave another legacy for the future generations of Costa Rica. By moving the tuna boats out to at least 100 miles, which is only another 40 miles in an ocean of territorial water, you can effectively protect an entire subspecies of dolphins. In a country famous for its protection of natural resources, this is little for the Costa Rican people to ask. Todd Staley is a fishing columnist for The Tico Times.